" The Slap invented by Larry Graham more than 40 years ago , has now become a technique practiced by most of the bassists . 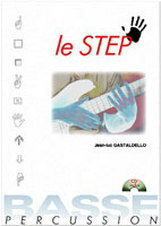 Whatever the musical style, it is harnessed to boost the bass playing . From these numerous influences, from this movement , came the desire to create a very rhythmic playing concept (called STEP ) coherently gathering a number of personal percussive technical effects or inspired by effects occasionally used by these famous contemporary bassists . " Percussive grooves based on STEP " sound effects "